We’re up front about our rates because we want you to make an informed and intelligent decision about where you take lessons. 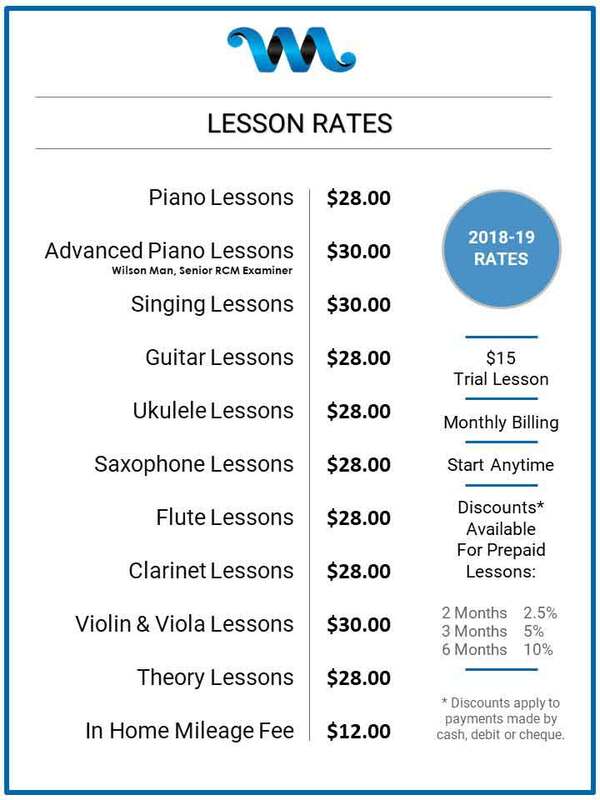 You’re probably comparison shopping among several Mississauga music schools and trying to figure out where to get the best value for your dollar. At the Wandering Minstrel Music School we only teach one-on-one music lessons which means each student has their teacher’s full attention 100% of the time. If you’re trying to decide between private lessons and group lessons please keep in mind that while group lessons are cheaper, students do not receive the same level of service or attention as private lessons. Group lessons have some benefits, but for most students the best option for learning music is private lessons. Choosing a teacher is a very personal decision. You or your child will have a long-term relationship with someone who will inspire you, motivate you and teach you to play your instruments with skill and joy. Is it just for fun? Are you aiming to pass your Royal Conservatory of Music exams? Are you planning to audition or compete in the future? What kind of music do you want to learn? We can cater your lessons to suit your goals and musical interested. By working out where you want to go and how you want to get there we can help you to find the best music teacher for your needs. The more qualified and experience your prospective teacher is the higher his or her rate will be. But you should also consider factors such as the school’s reputation, the equipment on site, recitals, exam results and whether it’s a convenient drive for you. Our teachers go the extra mile for their students and want to share their love of music! For some students learning music at home is the most comfortable and convenient option. If you have a hectic family schedule, then in-home lessons may be the perfect solution for you! In home lessons are the same length and quality as our studio lessons. There is an additional weekly fee of $12 per home (not per student) for a teacher to travel to your location. Lessons are billed monthly based on the number of weeks in each month. You will never be billed for statutory holidays, and we also offer the option to take time off during Christmas, March Break and summer holidays. Your payment is due at the start of each month. We accept payment by cheque, cash, debit or credit card. Lessons are automatically renewed every month until you decide to stop. We kindly ask that you give us 30 days advanced notice of your intent to discontinue. Do you like saving money? We offer discounts to customers who pay in advance for lessons. The catch? You can’t use a credit card. Payment must be be made in cash, debit or by cheque. Please see our Discounts page for detailed information.